Obverse: ROMANIA, coat of arms of Romania, face value 10 LEI, images displaying the process of making dies for coinage (from left to right): a sculptor-engraver artist working at the plaster, large scale model of the coin, the obtaining of the "master" hub at 1:1 scale with a transfer-engraver with pantograph, an engraver retouching manually the steel hub made with the pantograph, an operator making a working die using a hydraulic press, two working dies for the obverse and reverse of 1 ban 2005 coin, and such a coin in the middle Reverse: the first seat of the Mint, the first coins struck there - 1 leu 1870 and 20 lei 1870, years 1870 and 2010, circular inscription "MONETARIA STATULUI 140 DE ANI DE LA INFIINTARE" meaning "STATE MINT 140 YEARS SINCE ESTABLISHMENT"
As indicated by the missing date on the coin obverse, this coin should have been issued in 2010, year when 140 years since the establisment of the first modern mint at Bucharest were completed. The representations of the coins on the reverse were made with the same diameter, despite the fact they differ in sizes - 1 leu has 23 millimeters, 20 de lei - 21 millimeters. 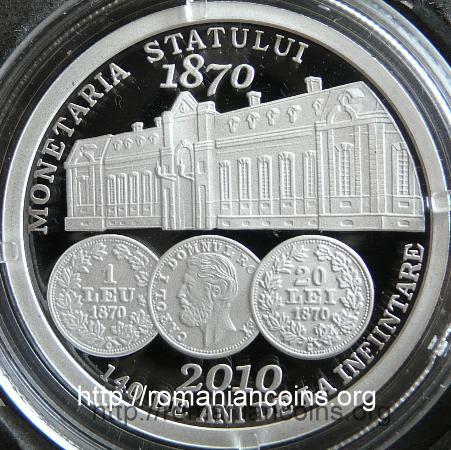 The first Romanian modern mint was established in 1870, having been inaugurated on the 24th of March. The Palace of the Mint was named in the epoch "Otelul de Monetă" - name obtained by translating the French term "Hôtel de la Monnaie", meaning Mint. This seat was demolished in 1912, on the same spot the actual palace of the Museum of the Romanian Peasant having been built. The Romanian authorities invested into establishing a mint in order to struck coins with the head of prince Carol I only. 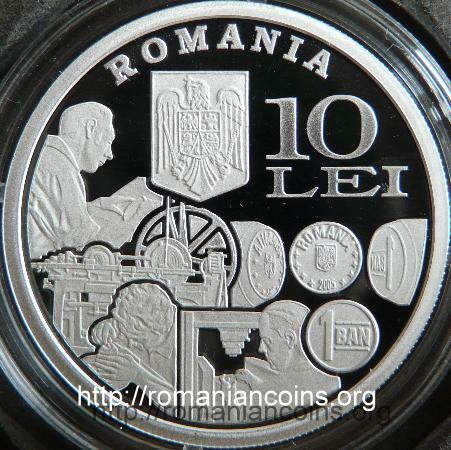 Such coins, sign of the Romanians' aspiration for independence, could not be produced abroad at he time. The Ottoman Porte, at that time suzerain power of Romania, vehemently opposed to the use of the head of the prince on coins, and pretended the Romanian coins to bear a crescent, as sign of vassalage. In 1870 the Mint functioned for only a few months, striking gold 20 lei and silver 1 leu pieces, on blanks imported from France. The Turks protested, and the coin production was stopped. In 1879, after the Independence War, the coinage was resumed, and continued with intensity until 1885. In 1890 gold 20 lei coins were struck there again. After 1890 the Romanian coins were struck abroad. The mint was re-establish in 1935, this time under the name of National Mint. Since the establishment of the Mint a quite large number of medals were also struck.